I was getting the hang of this walking thing. Four days in, the pilgrim’s morning ritual was starting to feel normal: get up, dress, eat, pack up, and follow the arrows. Even for an over-thinker like me, I started to really relax into and enjoy this simplicity of purpose. Before we got going in the morning, I tested how my ankle and shoulder felt from yesterday’s fall. The painkillers that Katrin recommended helped a lot and although my shoulder felt stiff when I lifted my pack, I walked without limping. On the way through Larrasoaña, we picked up snacks and discovered that the café owner had met the cast and crew of The Way when they filmed in the area. In fact, the scene where Tom’s pack falls into the river was filmed on the village’s little bridge. She pointed to a photo tacked proudly behind the register; it showed her smiling between Martin Sheen and Emilio Estevez. “How nice they were,” she said. Good on ya, Hollywood. It was not the first time I’d encounter locals with good things to say about the people associated with the movie. Out of Zubiri, the Camino crosses the Arga River and then follows its course, making for tranquil, burbling company through the woods. I was contentedly distracted by songbirds and wildflowers as we entered the forests. Along the way, I was stunned to see several types of orchids. Other plants I recognized included iris, purple gentian, and Scotch broom. How can I describe what it’s like to walk? Sometimes it’s a wet path in the forest with trees on all sides, sometimes it’s a paved road through a three-house town. Today we came around a bend and discovered an outdoor café with a brick oven set up in the back yard of an enterprising family’s home. There we grabbed a picnic table next to a laughing bunch of older Germans drinking beer at 11am. One guy had all kinds of leaves and flowers tucked into his felt hat, and while he talked animatedly, a bumblebee stopped by to pollinate one of the blossoms. Many pilgrims congregated here and we saw many people we knew: Lies, Nicole (who I’d met on the bus into Saint Jean), and Tess. These reunions with new old friends delighted me. Hungry, we sat down to enjoy a bocadillo sandwich with spicy chorizo and a hunk of Spanish omelet (called a tortilla), filled with onions and potatoes. Whoever says that the Italians have cornered la dolce vita hasn’t spent time in Spain’s Basque country. Marisela had been encouraging me to practice my Spanish, so after our mid-morning meal, I attempted to tell her what kind of dessert I was excited to share with them. I’d brought a bar from the States of my favorite dark chocolate with candied orange peel inside. “It has orange peel,” I clarified. “No, pelo is hair,” she said, still uncertain about my treat. Katrin quickly chimed in with her bit of Spanish, saying, “Oh, I know how to say the rest! It’s araña!” She was as incorrect as I. The day stayed comfortable even after the sun came out and a breeze kept us cool. We spread out on the path in the afternoon and talked less. Walking in the woods by the widening river, I got a closer look at some of the songbirds I’d been hearing over the previous days. I sketched the ones I didn’t recognize in my journal and also identified a robin, chickadee, and a magpie. When we crossed the river again, I saw clusters of purple flowers near the stream bed that I thought, at first, were crocus. On closer inspection, I discovered a tubular flower, completely without leaves. Because of its shape, I suspected it might be carnivorous, but Google and I later discovered its true identity: purple toothwort. 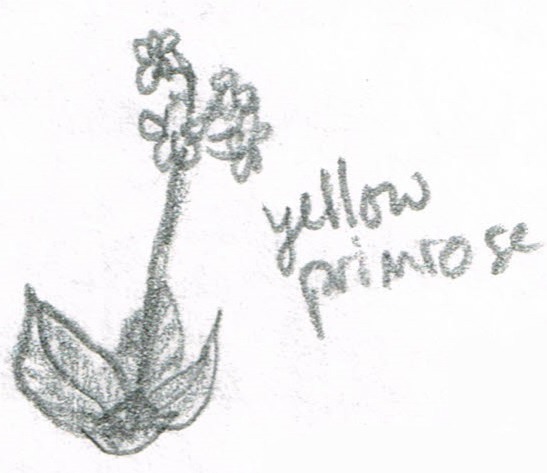 The sketch below is my attempt at the flower, and is not a bat (as one pilgrim guessed). “I think I will forever hear Marisela’s voice in my head saying, ‘Don’t worry.’ I’m so inspired by her search for a new path, a new career. And I’ll always hear Katrin’s voice saying, ‘Take your time.’ Like she really means it. In the afternoon, it was Marisela who hit a bump. We were about two miles outside of Pamplona when she stopped to inspect (what turned out to be) a massive blister on her foot. It was truly awful. She told Katrin and me that we were welcome to continue on without her into the city. After all the help she’d given me, I wasn’t about to leave her alone on the side of the road. So we sat with her, cooling our heels by the roadside for a while, and then walked slowly down a short hill to seek out a place to stay for the night. The scene that opened at the bottom was a gift: a wide stream with cascading rapids, a beautiful stone bridge, and an albergue almost as old as the Camino itself… right there in front of us. A Camino miracle. We sat on the stone steps waiting for it to open, not another soul around. Run by an order of monks, a brother welcomed us into the albergue, walked us through the chapel, and gave a short tour before checking us in. It turns out that one of the scenes in The Way was filmed in their courtyard (where the group is eating at a long table outdoors and the owner announces, “The Americans are here!”). At this point, we encountered a dilemma that would prove to be a theme throughout my journey: it was a late spring, but not yet warm. In fact, it was damp and cold. Because heat is expensive, it had already been turned off for the season. The stone walls of this ancient building made it colder and damper still. I wore my wool hat, coat, and all my layers indoors, yet I struggled to get warm. Marisela and I did laundry by hand in cold water — which didn’t help — hanging out our wet clothing outdoors on the line with hopes that it would dry overnight. Katrin and I went into town to use a library computer and we picked up a bottle of wine from a bar on the way back. After a nap, Mari went into town and came back with food – including instant noodle soup that Katrin had been craving (SO HOT! SO SALTY! SO DELICIOUS!). In addition to the soup, we made dinner together from of all the things we’d lugged along for lunch and never ate: Navarre sausage (similar to pepperoni), sheep/cow cheese, olives, bread, and the delicious vino tinto from La Rioja. Full and warmer, I could feel my mood lift. When a hot shower feels like the height of luxury, you know your expectations have been pared back. It was completely free of hairy spiders.